In Marxist theory the treatment of technology has generally referred to production, the means of production, the character of the labour process, and related matters. This follows the example set by Marx himself in his justly famous chapter on machinery and modern industry in Volume 1 of Capital which occurs in the part devoted to the production of relative surplus value. Neither there nor anywhere else in Capital is there any discussion or analysis of the impact of technology on consumption and via consumption on processes of capital accumulation and social development. Here was a clear example of an interaction of production and consumption resulting from technological change, one which from some points of view was certainly far from insignificant. The reason why Marx noted it only in passing and made no attempt to analyse it in depth, as he did with the consequences of machinery in the production process itself, was probably because he saw it as affecting only the consumption patterns of the capitalists and their dependents. As far as the working class was concerned, he believed that the capitalistic use of machinery had had disastrous consequences, ruining handicraftsmen and lowering the wages of factory hands by simplifying their work and opening the way for the mass employment of women and children. By comparison, the stimulation of luxury consumption by the capitalist class was a matter of secondary importance which not only could but should be abstracted from in studying the modus operandi of the capitalist system. In the beginning the automobile was of course a mere curiosity, but developed rapidly into a luxury good entering into the consumption of the upper class. "As long as motor cars were few in number," Lewis Mumford wrote, "he who had one was a king; he could go where he pleased and halt where he pleased; and this machine itself appeared as a compensatory device for enlarging an ego which had been shrunken by our very success in mechanization. "5 This was clearly the situation which obtained before the First World War: in 1910 there were some 19,000 people for every car in the United States.6 During the next decade, however, the automobile began to enter into popular consumption, the ratio of people to cars dropping precipitously to approximately 11 to 1 by 1920. On the side of technology and production, the decisive factor here was Henry Ford's introduction of the low-priced Model T, involving (as both cause and effect) such cost-reducing technologies as the assembly line and interchangeable parts. Since 1920 the people/car ratio has further declined as follows: 1930 — 4.5; 1940 — 4.1; 1950 — 3.1; 1960 — 2.4; 1970 — 1.9. At the present time, in other words, there are more than half as many cars as people in the United States. The automobile has become a mass-consumption commodity in the fullest sense of the term. And in the process it has profoundly altered many aspects of social existence for all classes and strata of society. The most obvious manifestations of this process — which the late Paul Baran and I have called the "automobilization" of society7 — are traffic congestion and pollution, and these are also the effects which have been most instrumental in focusing public attention on the social and environmental implications of automobilisation. But congestion and pollution are essentially superficial phenomena, comparable to the outward symptoms of a disease with deep roots in the organs of the body. If we are ever to deal with the disease itself we must go beyond the symptoms and study its etiology. In the present instance what we need first of all is to understand the ways in which the automobile in the process of becoming a mass-consumption good impinged upon and ultimately transformed the geography and demography of the country. The coming of the automobile as such did not change this situation. In the early years cars were expensive and unreliable so that only the well-to-do could afford them and their upkeep. In addition, except for city and town streets, roads were few and bad. Under these circumstances as far as the suburbs were concerned, cars complemented the existing patterns rather than changing them. Owned by the upper-income commuters and largely chauffeur-driven (the chauffeur fulfilling the role of mechanic as well as driver at a time when repair and service stations were all but nonexistent), cars expanded the area within which commuters could conveniently live but introduced no new elements into the picture. The 1920s saw the beginning of an extremely complex cumulative process, culminating in what it has become usual to refer to as today's "urban crisis." The immediately propelling forces underlying this process were, first, the cheapening of the automobile; and second, the extension of the road and highway network. All these cars would have had no place to go, however, had it not been for a vast increase in the road network. As a very rough indicator of what was happening here, the mileage of surfaced roads increased by 81 per cent between 1910 and 1920, by 88 per cent between 1920 and 1930, and by 97 per cent between 1930 and 1940.12 At the same time of course the quality and carrying capacity of the roads were greatly improved. In recent years, indeed, it has been mainly through the upgrading of roads or the construction of multilane freeways paralleling or replacing existing routes that the capacity of the highway network has been expanded. (3) Service industries largely dependent on the automobile. Here we include dealers, wholesalers of vehicles and parts, gasoline stations, and all sorts of garage and repair facilities. In 1967 there were about a half million establishments under these headings employing over two million employees. If we assume that in most cases the proprietors also work, we would conclude that something over 3 per cent of the total labour force is employed in directly servicing automobiles. And this does not count the numerous categories of employment, such as motels and resorts, which are almost as dependent, albeit indirectly. (4) Users of highways for profit. After a rapid process of centralisation, there were 1250 intercity trucking companies in 1968, employing nearly a half million workers and carrying around 20 per cent of the country's long-distance freight. At the same time the Teamsters Union, which is the largest union in the country with a membership of more than 1,700,000, is centred in the fields of trucking and warehousing. In addition of course most big corporations have their own fleets of trucks. And there are other types of commercial highway users such as buses (urban and intercity) and taxicabs. (5) Makers of highways, including an important segment of the construction industry (about 11 per cent of the total measured by value added in 1968) and a large number (about 600,000 in 1969) of government workers (federal, state, and local) employed in the planning, supervising, maintaining, and repairing of highways. This bare listing of the main components of what may be called the automobile-industrial complex could, and in any thorough study should, be complemented by an analysis of its structure and modus operandi. Here it must suffice to note that these various interests are represented by a large number of trade associations and other organisations which are amply financed and staffed and are active on a full-time basis at all levels of government as well as in the realm of propaganda and opinion formation. As Jerome puts it, "The scurry work, the wheedling and coercion, the swapping of favors and collection of political debts, is done by a large and complexly interwoven network of associations and pressure groups. "16 As would be expected, in other words, the enormous economic wealth and power of the automobile-industrial complex have been effectively mobilised and brought to bear at the political and ideological levels. Let us now turn to the impact of automobilisation on the development of cities and the living patterns of their inhabitants. Decisive in this connection has been the obliteration of the old sharp dividing line between city and country. Drive from the centre of an American city today in any direction, and you will of course eventually come to open country. But you will never cross a boundary clearly demarcating the one from the other. What you will observe instead is a gradual thinning out of the density of settlement. The old distinctive commuter suburb dependent on rail transport has been swallowed up and incorporated into an expanded urban area.17 And in some places, particularly in the northeast between Boston and Washington, expanding urban areas or metropolises have run into each other.18 In such cases your trip from one city centre will take you through roughly concentric rings of decreasing density into another set of concentric rings of increasing density. This obliteration of the old distinctions between city, country, and suburb — often called "urban sprawl" — would have been impossible but for the automobile which, with its complementary road and highway network, has introduced what may be called a generalised factor of mobility replacing the former limited and specific modes of mobility. The car can go in any direction for any distance. The horse-drawn vehicle, on the other hand, is necessarily short-haul, and both railroads and trolleys are track-bound and therefore restricted to certain prescribed routes. These specific modes of mobility impose a definite shape on both economy and society, much as a skeleton may be said to impose a shape on a living body. With the coming of the generalised factor of mobility, these constraints are removed and radically new locational patterns become possible. Urban growth on this scale would have involved a comparable increase in the geographical size of cities even if the new residential areas had been of the built-up, high-density variety. But given the general mobility factor introduced by the automobile, the urban-sprawl pattern, involving a much more than proportional increase in area, became both a possibility and a reality. Where in earlier times the children of slum-dwelling immigrants had, as they climbed the economic ladder, moved into compact neighbourhoods within the built-up city, now the tendency was increasingly to move to the fringes and the formerly railroad-dependent suburbs. The slums in turn were filled up no longer by immigrants from abroad (the First World War effectively put an end to this kind of immigration) but by those expelled from U.S. agriculture, including disproportionately large numbers of blacks, Mexican-Americans, and Puerto Ricans. And now comes the final act in what may be called the drama of the car and the city. The massive outflow of population from the old inner city brings with it much more than a mere change in residential patterns. As people move out, all sorts of economic activities move with them, and a process of obsolescence and decay is initiated in the centre. First to follow the population movement of course are retail and service establishments. But these are soon joined by manufacturers and wholesalers who on the one hand now find a labour supply and cheaper land on the outskirts and on the other hand are repelled by the deterioration in the centre. The movement of residences comes first, but the movement of jobs soon reinforces the movement of residences, which in turn stimulates further movement of jobs, and so on in a self-reproducing cumulative process. This means that an enormous amount of transportation of goods and people has to take place day in and day out just to keep the life of the city going. Much of this is commuting in the traditional sense of the term, i.e., movement of people living in the outskirts to and from work in the city centre (this obviously creates all sorts of special problems because it is concentrated in a few hours in the morning and evening). But much more in the aggregate is of a different character: goods being supplied to economic units scattered all over the urban area; children going to and from school; shoppers getting to retail outlets and back home again; people getting together for social purposes; and a new and increasingly important kind of commuting, i.e., the going to and from jobs by workers who both live and work in the outskirts, which may involve relatively short trips in the same section but also may involve long trips from a section on one side of the city across the centre to another section on the other side (with all possible variations in between). Except in the case of traditional commuting, which lends itself very well to the use of public transportation, almost all of this movement now takes place by private automobile. An impressionistic notion of how vast the volume of travel by private automobile has become can perhaps be derived from the following two items culled from recent issues of the New York Times: (1) According to a Gallup Poll, 81 per cent of all American workers travel to and from work by automobile. (May 30, 1971); (2) The Associated Press reports that "American housewives average about 100 miles each week just in family chauffeuring and errands around town." (January 23, 1973). 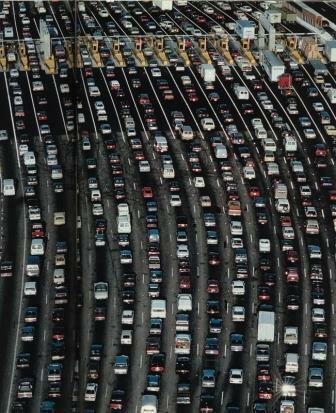 With the number of cars, the urban population, and the area of sprawl all steadily expanding, it is no wonder that pollution and congestion are coming to be experienced as the manifestations of an acute urban crisis;21 or that the general factor of mobility which the automobile was in its golden age is increasingly turning into its opposite. One final point needs to be made in this highly sketchy survey of the interrelation and interaction between the car and the city. When we speak of traditional commuting (outskirts to city centre and back), we are talking primarily about a small number of cities which are both big and also old in the sense that they had railroad-dependent suburbs in the pre-automobile age — chief among them New York, Chicago, Philadelphia, Boston, and San Francisco. In addition, these are cities with highly developed business centres not directly related to production, embracing national or regional corporate headquarters, banking and insurance, shipping offices, and so on. While there has been considerable outward movement of such functions, on the whole the advantages of keeping them together, in a compact area within which rapid face-to-face communication is easily maintained, are so great that these central business areas have grown with the overall growth of the metropolis. As a consequence, too, other economic and cultural activities which are encompassed in the concept of "downtown" — hotels and restaurants, theaters and concert halls, museums, elegant department stores and specialty shops — have survived and even flourished. Los Angeles is no longer a city as the term has been conventionally defined: Sam S. Taylor, general manager of Los Angeles traffic, calls Los Angeles a "mobile region." For anyone looking toward the future, toward the end result of the full autofication of the American metropolis, Los Angeles is the phenomenon to analyse most carefully. When Lincoln Steffens went to the Soviet Union just after the Bolshevik Revolution, he proclaimed, "I have seen the future — and it works." Since that was written a great deal has happened, and it seems less likely today than it did then that the future lies with Gasopolis. The recently created federal Environmental Protection Agency has even proposed that, in order to cope with the smog problem, automobile traffic in Los Angeles should be cut by 80 per cent through gasoline rationing. This was, to be sure, more for its shock effect than because the EPA or anyone else expects it to be taken seriously (one estimate is that an 80 per cent reduction in auto traffic in Los Angeles would mean the loss of 400,000 jobs). Still, this, like the already noted change in the public attitude toward the Interstate Highway System, is one of many indications that urban development in the United States is entering a new period in which increasingly serious efforts will be made to transform the automobile from the master to the servant of people. To accomplish these ends, and at the same time to eliminate congestion and pollution and in other ways make the city a better place to live, it seems to me an absolutely necessary (though far from sufficient) condition that the causal link between the location of economic activity and profit anticipations has to be decisively broken. Only if a rational job pattern is planned and assured for years ahead will it be possible to develop new residential communities with appropriate population densities and efficient public transportation systems both within and between them. And this requires not only public ownership of land but also socialisation of the entire investment process so that production can be guided not by profit but for the satisfaction of the people's needs. In these notes I am drawing exclusively on my personal experience and acquired knowledge of conditions in the United States. But I believe that what is said applies, in the main, to the other imperialist centres in Western Europe and Japan. Quoted in William V. Shannon, "The Untrustworthy Highway Fund," The New York Times Magazine (October 15, 1972), p. 121. I grew up in a suburb of this kind. Several years before the First World War my family moved from New York to a suburb across the Hudson River in New Jersey. Our house was around a mile in one direction from the town and the railroad station, about as far away as the commuters then lived. In the other direction, between our house and the River (which, except for the underwater Hudson Tube between lower Manhattan and the Newark/Jersey City urban area, could only be crossed by ferry in those days), there was more than a mile of untouched woodland. The spread of the automobile and the building of the George Washington Bridge across the Hudson totally transformed the region and its relation to the city in the manner analysed in the text. Ibid, p. 458. The increase was down to 42 per cent for the decade of the 1940s owing to the drastic curtailment of new construction during the Second World War, and comparable figures do not appear to be available for 1960 and 1970. A ranking of U.S. manufacturing industries by ten-year average rate of return on capital (for the decade 1949-1958) shows Motor Vehicles and Parts first with 28.2 per cent, while the second ranked industry trails with 23.2 per cent. B. C. Minhas, An International Comparison of Factor Costs and Factor Use (Department of Economics, Stanford University, 1960), p. 80. John Jerome, The Death of the Automobile (New York: W. W. Norton, 1972), p. 112. The title of Jerome's book, for better or worse, reflects wishful thinking more than fact, actual or prospective. The following passage from John Jerome's lively study, cited in the previous footnote, illustrates the change in the public attitude toward roadbuilding which is now under way. Back in 1956, he points out, the roadbuilders exulted in the magnitude of their works: "How the press releases rolled! Four hundred square miles of pavement! One and a half million acres of new right of way! Excavations to bury Connecticut knee deep. Sand, gravel, and stone to build a wall around the world fifty feet wide and nine feet high. Concrete enough for six sidewalks to the moon …. [B]y 1971, local lawsuits or local government action had halted the construction of Interstate projects in fifteen major American cities …. It had become virtually impossible to gain acceptance for a new Interstate in any urban area, and many rural segments of the plan … were in trouble…. The sea change in the American mood is precisely characterised by the Bureau of Roads' press releases. When the Interstate was initiated, consumption of a million and a half acres of right of way or four hundred square miles of forest was fit material for boasting; now it has become a shameful admission." Ibid, pp. 105-106. This changing public attitude doubtless portends other significant changes in the period ahead. This is a subject, however, which falls outside the scope of the present essay. It is true that what are now sometimes called exurbs, lying 50 miles or more from the city centre, have some of the characteristics of the older type suburbs. But there are no structural features such as were imposed by dependence on rail transport which protect them from being swallowed up in their turn. This indeed seems likely to be their ultimate fate as long as population continues to grow and there is no basic change in the socio-economic system. The Boston-Washington region — which includes New York, Philadelphia, and Baltimore, as well as a number of lesser but still large cities — has been subjected to intensive study by the French geographer Jean Gottmann (Megalopolis: The Urbanised Northeastern Seaboard of the United States, New York, 1961). Gottmann naturally has to deal with the automobile in many contexts, but he appears not to be aware of its decisive role in the dynamics of the process under study, a fact which is perhaps best explained by the book's total lack of any coherent theoretical framework. In the language of North American urban planners, "developed" land is that which is actually used for any urban purpose (including parks), while all other land within the urban area is "open" or "undeveloped." Hans Blumenfeld, "Criteria for Judging the Quality of the Urban Environment," The Canadian Architect (November, 1972), p. 47. Let me add that this limitation of scope has also precluded more than passing allusions to the qualitative aspects of that condition. In particular the differential impact of automobilised urbanisation on various income levels and social groups has been almost totally omitted. The poor who cannot afford cars and the elderly and handicapped who are unable to make use of them regardless of their income are either effectively immobilised or confined to very limited and usually decaying areas. This adds a tragic dimension of helplessness and misery to millions of already blighted lives. In making judgments of this kind one is likely to be influenced by one's personal experience. I live in the New York metropolitan area in what used to be an old-style suburb. With a suitable improvement in the commuter railroad service and the inner-city subway-bus-taxi network — both of which are now in bad shape — I can easily imagine that I would hardly ever be tempted to drive into the downtown area. On the other hand, I also find it hard to imagine even an elaborate public transportation system which would satisfactorily substitute for the private car in the various other kinds of movement that are necessary for everyday living in the metropolis. This essay first appeared in Monthly Review, vol. 24, no. 11 (April 1973). It has been posted at Links International Journal of Socialist Renewal with the permission of Monthly Review.